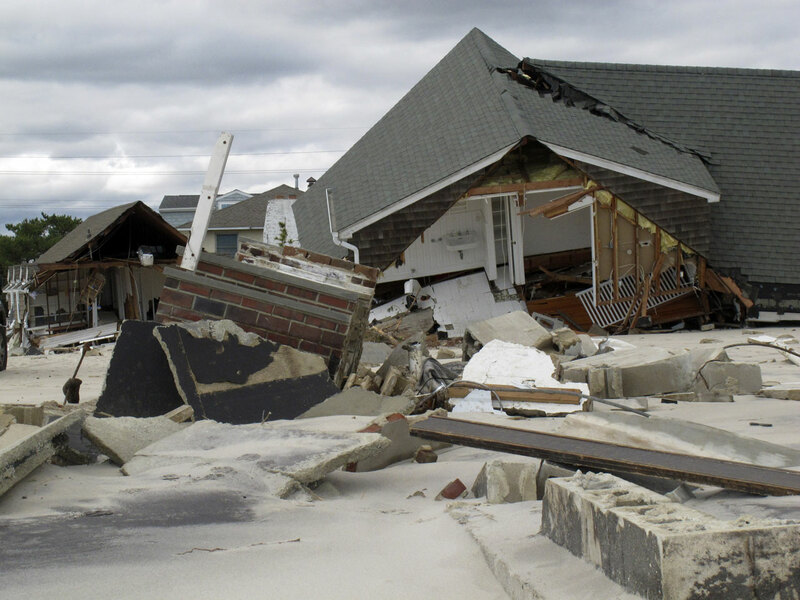 New estimates from forecasting firm Eqecat put the damage from superstorm Sandy at as much as $50 billion, making it the second most expensive storm in U.S. history after Hurricane Katrina. The new numbers Eqecat released Thursday are more than double the firm's previous estimate. Eqecat said Sandy may have caused between $30 billion and $50 billion in total economic losses, including property damage, lost business and extra living expenses. The cost to insurance companies could run as low as $10 billion and as high as $20 billion. NYC sea barrier proponents: "The time has come"
The firm pointed to two reasons that Sandy will leave a bigger bill than it first thought. Power outages are more widespread than in a typical Category 1 storm, Eqecat said. Sandy knocked out electricity for more homes and businesses than any other storm in history, according to the Department of Energy. On Friday, more than 3.8 million homes and businesses were still without power. At least 92 people in the United States have died, with at least 41 deaths in New York City. The lack of subway service in New York City and blocked roadways will also push the total cost higher, Eqecat said. Before the storm hit, Eqecat had estimated that total economic losses from Sandy could range as high as $20 billion and that losses to insurance companies could reach $10 billion. Payouts for insurance claims are typically a fraction of the overall cost to the economy. If the damages run into the high end of Eqecat's estimates, it would make Sandy the second-costliest U.S. storm after Katrina in 2005. Katrina's overall costs were $108 billion, which would be the equivalent of $128 billion today. Even after adjusting for inflation, the high end of Eqecat's damage estimates for Sandy would be higher than those caused by previous major storms. Andrew, which struck in 1992, cost $44 billion in today's dollars, and the Ike storm of 2008 cost $32 billion.